As physical therapists it is our job to consider all potential contributors to a patient’s recovery. While we do a great job of accounting for the physical components of rehabilitation, such as strength, flexibility and prior level of function, we often overlook the importance of a less obvious component: nutrition. Nutrition plays a pivotal role in the healing process and can either enhance or hinder a patient’s recovery from musculoskeletal injury. While it is not in our scope of practice to design nutritional plans, we should possess a baseline knowledge of nutritional influences in musculoskeletal healing. Physical therapists have arguably more contact with patients than any other healthcare provider throughout the recovery process. We are therefore in a great place to remind our patients of the importance of adequate nutrition. If you work with athletes or active patients, you have likely had your patients express to you that they are fearful of potential weight gain when rehabilitating an injury. Patients who may have run five or six days per week are now forced into a period of relative inactivity. Their weight concerns are valid, but under-eating is not the answer. While active patients may require fewer total calories than they took in prior to injury, they should not be eating as though they are sedentary. A caloric excess when injured can result in increased fat deposition, but inadequate caloric intake will accelerate muscle loss. The balance is delicate. During recovery from a musculoskeletal injury, nutritional needs are similar to those required during muscle growth. When injured, or after surgery, we can burn anywhere from 5-50% more calories per day. Our metabolism essentially spikes in order to aid the healing process. Therefore, limiting calories will prolong the rehab process and will also decrease protein stores, which inhibits the body’s ability to repair an injury. Since under-eating decreases lean mass of healthy tissues and decreases muscle protein synthesis, patients will accelerate muscle atrophy if they eat at a caloric deficit. Basically, your patients will get weaker and will have more difficulty rebuilding strength if they under-eat when injured. So next time your patients ask you about restricting their intake during the rehab process, make sure to remind them that under-eating will only prolong recovery and make it more difficult to return to prior level of function. We are all familiar with the phases of healing: inflammation, proliferation and remodeling. While most of us are well versed in the musculoskeletal changes that occur during these phases, it is important to understand how nutrition can influence the healing process. Let’s first take a look at inflammation. In the inflammatory phase our goal is to control inflammation and prevent excess inflammation. Make note that it is NOT our goal to completely stop inflammation. Inflammation is a normal and necessary step in the healing process. Excess inflammation, however, will impair blood flow and potentially cause cell damage to the healthy tissue around the injury. During the inflammatory phase, we can take control of inflammation with dietary fats. Dietary fats protect against inflammation because they signal the movement of blood flow and promote the function of immunity cells. To combat inflammation, patients should increase consumption of the essential fatty acid, omega-3. Omega-3 is known as an essential fatty acid because our bodies cannot make it. In order to use this inflammatory fighting nutrient, we must increase consumption omega-3 rich foods, such as olive oil, fish oil, avocado, pecans, walnuts and almonds. It is also important that patients limit consumption of omega-6 fatty acids, such as vegetable oils, fried foods and processed foods. This is not to say that we need to eliminate all sources of omega-6, but we want to even out the ratio of omega-3 to omega-6. The ideal proportion of omega-3 to omega-6 fatty acids should be 1:1, although most of us consume a ratio of 1:10 per day. Fruits and vegetables will also aid in controlling the inflammatory process because they are rich in antioxidants. When in doubt, choose brightly colored produce. Some examples include broccoli, which contains sulforaphane and many help cartilage breakdown; citrus fruits, which contain vitamin C, which supports collagen and proteoglycan synthesis; and red grapes, which contain resveratrol, which suppresses pro-inflammatory cytokines. Additional inflammatory mediators include turmeric and garlic, which patients can add as dietary supplements. We’ve moved on to the later phases of proliferation and remodeling. Our goal now is to prevent atrophy and promote soft tissue repair for return to function. As physical therapists we know all too well that our patients will experience muscle disuse atrophy during these phases. We have a lot of tools at our disposal to get them stronger, but what if there was a way to decrease the severity of muscle atrophy? Protein may be the answer. 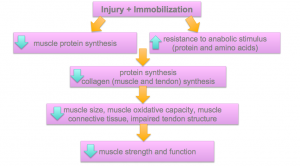 Musculoskeletal injuries are often accompanied by anabolic resistance, which is the reduced ability of the muscle to synthesize protein. When the body is in a state of anabolic resistance, it has a limited ability to build muscle even with adequate protein intake. This causes muscle size and strength to decrease. Inevitably, function declines and we and our patients have a lot of work to do. Check out the schematic below for a visual on this cascade toward muscle loss. The news is not all bad though. 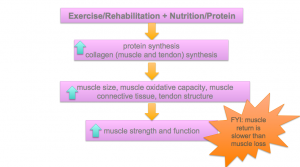 Nutrition is an effective intervention to attenuate this cascade from muscle disuse to muscle atrophy. When considering energy requirements, our patients must be especially mindful of protein intake due to the potential of anabolic resistance. However, as mentioned earlier, many athletes will decrease overall caloric intake when injured due to a decline in physical activity. Once again, it is important to remind patients that this will only accelerate muscle loss during injury. The second figure below depicts a more hopeful recovery process. As you can see, nutrition can enhance the rehab process by contributing to improved muscle strength and function. Many athletes or active patients were conscious of protein intake prior to injury, and should continue to be mindful of protein stores during rehabilitation. Impairments in muscle protein synthesis rates are a major cause for disuse atrophy. In order to support muscle mass, patients should be eating an adequate amount of protein. Energy balanced diets with a moderate (1.0 g/kg/BW) compared to a low (0.6 g/kg BW) protein intake prevent a decline in body protein synthesis, thus allowing patients to maintain more strength. It has also been suggested that injury dietary strategies should optimize the anabolic response to each individual meal. This means that we should space protein intake evenly across the day every 3-4 hours to keep muscle synthesis rates elevated over a 24 hour period. While “eat more protein” is good advice, we can give better advice when we consider the digestible properties of different types of protein. Whey protein is more rapidly digested than soy or casein and it has a greater anabolic response and is thus a more effective source during injury. We should also be aware of the role of amino acids. Leucine is a branched chain amino acid that has a unique ability to stimulate muscle protein synthesis. Therefore, supplemental leucine will be beneficial. Omega-3 supplementation is another effective way to minimize muscle disuse atrophy, as it has been shown to enhance anabolic sensitivity to amino acids, thus making it easier for our bodies to use protein. Gaining knowledge on the role of nutrition in the rehabilitation process will allow us to be more effective practitioners and will enhance patient recovery. Of course, if a patient has specialized dietary needs then it is best practice to refer to a trained nutritionist. However, for basic nutritional questions and concerns, we can serve as a source for our patients. Thomas Edison once predicted that “the doctor of the future will no longer treat the human frame with drugs, but rather will cure and prevent disease with nutrition.” As future leaders of healthcare, physical therapists should start to consider the influence of nutrition on our practice in the same way that many other healthcare practitioners have begun to do. A patient’s nutritional choices have a direct effect on our work in the clinic. In order to truly optimize patient performance, we must consider the influence of nutrition on healing. Burd NA, Gorissen SH, van Loon LJ. Anabolic resistance of muscle protein synthesis with aging. Exerc Sport Sci Rev. 2013 Jul;41(3):169-73. Bilku DK, Hall TC, Al-Leswas D, Dennison AR. Can enhanced recovery programmes be further improved by the addition of omega three fatty acids? Ir J Med Sci. 2012 Dec;181(4):453-7. Magne H, Savary-Auzeloux I, Rémond D, Dardevet D. Nutritional strategies to counteract muscle atrophy caused by disuse and to improve recovery. Nutr Res Rev. 2013 Dec;26(2):149-65. Tipton KD. Dietary strategies to attenuate muscle loss during recovery from injury. Nestle Nutr Inst Workshop Ser. 2013;75:51-61. Tipton KD. Nutritional Support for Exercise-Induced Injuries. Sports Med. 2015 Nov;45 Suppl 1:93-104. Wall BT, van Loon LJ. Nutritional strategies to attenuate muscle disuse atrophy. Nutr Rev. 2013 Apr;71(4):195-208. Wall BT, Morton JP, van Loon LJ. Strategies to maintain skeletal muscle mass in the injured athlete: nutritional considerations and exercise mimetics. Eur J Sport Sci. 2015;15(1):53-62. 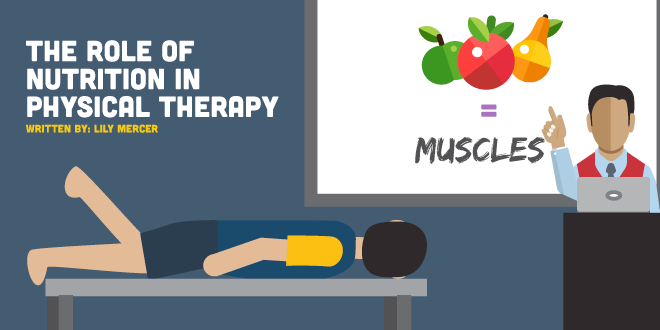 Why do Physical Therapists Believe in Ineffective Treatments?